We've just had a really enjoyable evening watching Chelsea, Alfie's favorite English Premier League football team, beat Mexico's Club America in an exhibition match, 2-1. All dressed up in Alfie's spare Chelsea jersey and cap, we joined the 46,000 fans in the 50,000-seat stadium and screamed our hearts out. 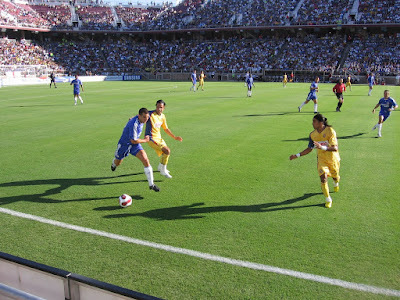 Although the Stanford Football Stadium is thousands of miles away from Stamford Bridge, the stadium had its fair share of Chelsea Blue shirts -- along with the yellow jerseys of Club America as well as a rainbow of team colors of football supporters from around the world. I think I enjoyed this game most out of all the Chelsea games I've watched, mainly because of our seats. We had front row, center seats, less than six feet from the sidelines. True, being so close has its disadvantages -- you lose sight of the "big picture", and individual players grab your attention, distracting you from the progress of the game. But on the plus side, it was an amazingly intimate experience (hey, I'm more of a people-watcher anyway, not a rabid fan of the game). We could actually hear the players shouting to each other and hear the thud of the ball as it hit their feet or chest. Everyone seemed bigger, more muscular, and faster that how they appear on television. Since we were watching the game almost at eye level, I almost felt like we were sitting on the grass at the park, watching some amazing college kids playing a game, and after they finished it would be time for 3Po and Jammy to get on the field and start their soccer class. This was truly a once-in-a-lifetime experience because there's no way we could have gotten seats like this at a regular Chelsea game -- that would be way too expensive for us and season ticket holders would get first crack at the seats anyway. It's going to be hard to go back to watching matches up in Row 141 instead of Row 1.